Many family caregivers feel like they can do it all—manage their own families, excel at work, run their household and meet the needs of an aging relative. The truth is that nobody can do all of those tasks well by themselves. When caregivers won’t ask for help or don’t have a support network in place to help them care for their elderly relative, they can experience a lot of stress. Chronic stress leads to burnout, and at that point, the caregiver isn’t able to do well in almost any area of their lives. The physical and mental demands of caregiving can take their toll on adults. Caregivers are more likely to develop significant issues like anxiety and depression. When family caregivers don’t take good care of themselves, they aren’t in a good position to take care of anyone else. Some of the red flags for burnout in family caregivers include insomnia, avoiding friends and family, forgetfulness, increased alcohol use, poor eating habits, weakened immune system, and weight changes. Many family caregivers don’t take the time to care for their own health, including visiting their doctor regularly. In order to reduce the level of stress in their lives, family caregivers should spend some time on identifying the specific sources of stress. By breaking down what is causing the most stress, they can look for specific solutions. Caregivers can identify resources that they and their elderly relative can use, whether that’s among family and friends or within the community. Taking action is the best way to solve problems regarding caregiving and reduce the stress that so many people face. 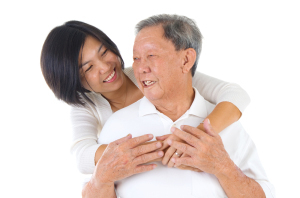 There are many ways for family caregivers to reduce stress in their lives. The most important is for them to take a break from their responsibilities. This means getting help with basic tasks like preparing meals, transportation, bathing, grooming and more. They must ask other family members to step in and provide some care for the elderly relative to give themselves a break. Senior homecare agencies can also provide aides to come in and help as often or as little as desired. Senior daycare centers, senior citizen centers and even church functions can be wonderful places for the elderly to spend some time with others and provide a break for caregivers. Other things that family caregivers can do to minimize the physical and mental effects of stress include taking time for rejuvenating activities, such as hobbies, leisure time and relaxing with close friends and family. They can also eat healthy, exercise and make necessary visits to their doctor and therapist. The more they diversify their responsibilities, the better they will be able to handle the stress of family caregiving. Perhaps the hardest thing for family caregivers to do is to fight the guilt they often feel when they do take time for themselves. It’s not selfish to put themselves and their needs first and it will ultimately help them do a better job in meeting the needs of others. By learning to seek out and ask for help and use homecare resources available, they can have a more rewarding relationship with their elderly relative. For Homecare Services in Cordova TN, please contact the caring staff at Personal Care Services MidSouth today! This entry was posted in Homecare Cordova TN, Personal Care Tips and tagged Homecare Cordova TN. Bookmark the permalink.